A new D.C. center provides a place for the city's homeless population to relax, shower, do laundry and access social services during the day. And its design makes its guests feel at home. See photos. On a 30-degree day in early March, the basement of New York Avenue Presbyterian Church, just blocks from the White House, was teeming with activity. Under a ceiling lined with dozens of hanging green plants, folks were pouring hot coffee, folding clean laundry and playing card games at wood-finished tables arranged in front of an 85-inch TV screen. The realities of the outside environment — winter’s stinging winds, gray skies and bare trees — seemed worlds away. And that’s exactly what Paola Moya intended when designing D.C.’s new Downtown Day Services Center at the intersection of H Street and New York Avenue NW. 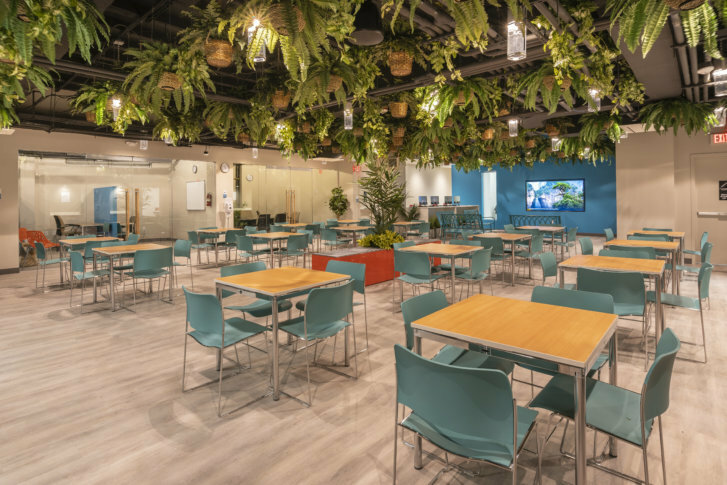 “The whole concept throughout the entire space was that [guests] have a very serene, a very oasis-like space where they come and they feel welcome; they don’t feel judged,” said Paola Moya, CEO Moya Design Partners. Since the Downtown Day Services Center opened in late February, the 7,600-square-foot facility has served some 100 individuals experiencing homelessness each day, according to Neil Albert, president and chief executive officer of the DowntownDC Business Improvement District (BID), which operates the center. Between 9 a.m. and 5 p.m., Monday through Friday, visitors can access health care, housing, legal and case management services. There are also showers, laundry machines, computers, snacks, entertainment — even a barber shop. “Here, the idea is it’s a one-stop shop for those needs,” Moya said. According to D.C.’s 2018 Point-in-Time count, there are 6,904 adults and children experiencing homelessness in the District. Before the opening of the Downtown Day Services Center, the city did not have a centrally located facility for homeless individuals to access during the day, DCist reports. Last year, the city awarded the BID $1.7 million to open and operate the center, with support from the D.C. Department of Human Services and other partners. Moya’s work to transform the old church basement into a clean and calm space began about six months ago. She designed the central gathering area with a courtyard in mind, filling it with lantern-style lights and greenery. “I knew that the plants were going to be something soft and gentle, just in the texture,” she said. Light floors, bright furniture and a neon sign behind the front desk give it a modern feel. Blue-painted walls and a garden mural make it almost spa-like. “I thought that it was such a beautiful analogy of coming through a garden and pretty much being in this courtyard,” Moya said. The Downtown Day Services Center is located at 1313 New York Ave. NW. For information on specific times and services, visit the center’s website.